Going native is a time-honored tradition. What’s more fun—traveling as a tourist or blending in with the locals? I choose the latter. 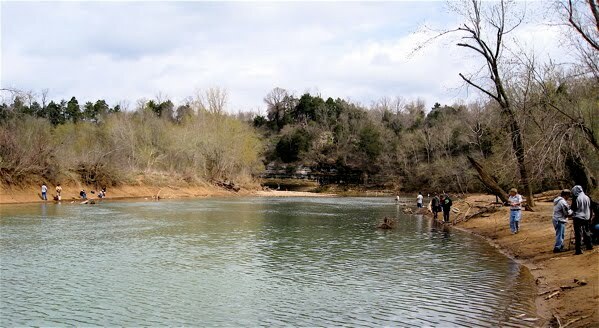 Which is why a sweltering spring morning in Goshen, Arkansas, found me hanging around on the limestone banks of the White River with a bunch of good ol' boys and even more first generation immigrants, a cheap spinning rod in my hand. I was there to go bassin’. Middle American rivers and reservoirs emptying into the Mississippi mark the pan fisherman’s Mecca. You’ve got catfish, crappies, sunfish, perch, and several varieties of bass, all vying for the pan, all tasting exceptional when fried up fresh. In my younger years, when I first discovered the pleasures of trout on a fly and its attendant rituals, I pitied the bassmasters with their jon boats and fish-finders and trucker caps. They struck me as an antediluvian species, as antiquated as the country store. Well, these days as we drive the endless strip (getting longer every year) waiting for pavement to give way to dirt and for fast food joints to give way to fishing holes, don’t we all yearn for the dusty commerce of the country store once again? And so it is with the bassmaster, who is the backbone of angling in America. McGuane is right: When the trout are lost it's surely time to smash the state. But when there are no more bass and no more bass fishermen we will have finally screwed the pooch once and for all. Luckily for me my spring break with the in-laws in Fayetteville just happened to coincide with a great annual tradition for bassmasters across the tick and chigger-infested interior: the running of the white bass. There are bigger bass and there are tastier bass; rarely do you encounter a more prolific bass. The limit in Arkansas is 25 per day. 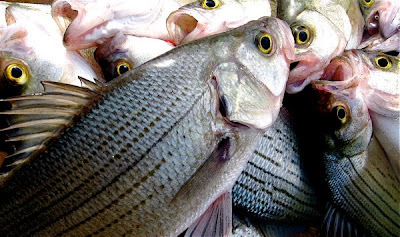 Morone chrysops looks like a smaller version of its cousin the striped bass. Males are smaller than females, usually weighing under a pound; females, which follow the males upriver, might push five pounds, though a two-pounder like this one my boy caught is considered large. I stumbled upon the white bass fishery by accident while scouting for morels. Crossing the Twin Bridges where Richland Creek empties into the White River I couldn't help but pull over to see why so many trucks and cars lined the road. A guy with a stringer loaded with fish and a big grin clued me in. We walked down to the water's edge to see the commotion. 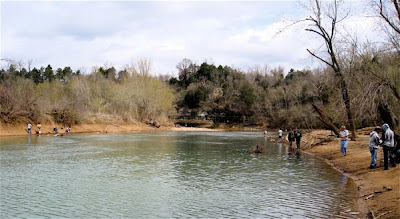 Anglers were hauling in fish up and down the banks. "This ain't nothin'," said one elderly man in a canoe. "At the peak it's every cast." The fish pour out of Beaver Lake impoundment on their spawning run like an angry horde, chasing each other around the riffles, slashing at lures, and putting their fierce dispositions on generous display. I talked to a few knowledgeable bassers with the heftiest stringers. Crawfish, they advised, and rubber minnow jigs. I was back the next day. That night we made fish tacos at my brother-in-law’s place. Filleting out 15 bass was a bit of a chore for this bassmaster-in-training. Bass are bonier than the trout and salmon I’m used to, although the concept is similar. I thought about Mexico while working the fillet knife. The best fish tacos I ever ate were prepared beachside on the Baja while a bunch of us attempted to surf our hangovers away during a bachelor party weekend. Despite the gulf's promise of renewal, one by one we washed up on the beach feeling more unsteady than when we started, lured by the thought of stable ground and the smell of fish tacos cooked right on the spot over a camp stove. This has been my template ever since. If you try to complicate the matter, you’ll miss the point. 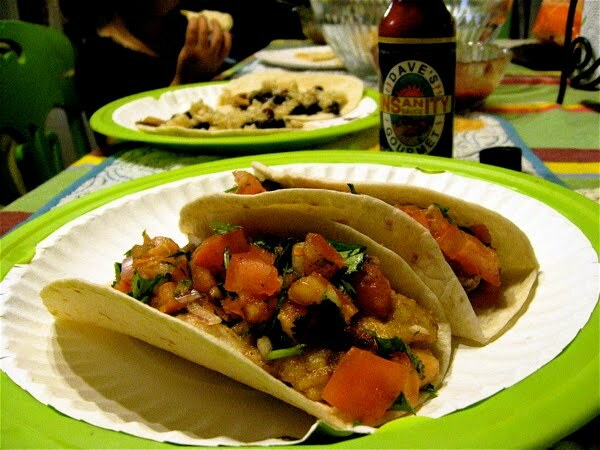 Fish tacos should be a perfect blend of white-fleshed fish, warm tortillas, and piquant salsa. Nothing more. The preparation was so simple I’m almost embarrassed to repeat it here, but if you’ve never made your own fish tacos before it’s something you should do—so here are the basics. 1. Make a simple salsa. For instance, chop together 2 large tomatoes, 1 small red onion, 1 clove of garlic, a half-cup of cilantro, and a hot pepper. Adjust amounts to taste. Squeeze in a half lime and season generously with salt. Set aside to marry. 2. Heat flour tortillas wrapped in foil. 3. Dredge fish fillets in seasoned flour and fry in butter over medium heat until flaky. That’s it. Now make your tacos, garnish with hot sauce, drink a refreshing beer—and think about going native. 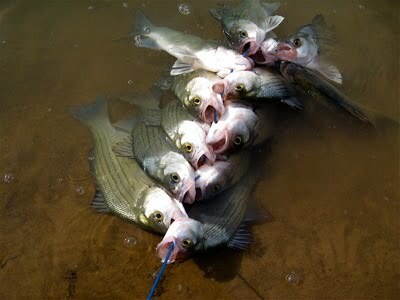 That's a heck of a haul of bass, Lang, and it's amazing how much they look like stripers. I like your minimalist approach to the tacos, too. They fish white bass on the wide slow part of the Wolf River near Fremont, WI. The boats are practically side by side, and there is no daily bag limit. Aye aye captain, off to make them now! Looks good and fun! But, why fillet them? We fry our fish that small after butterflying them, and the tail is the tastiest part! Heayll yeah! I used to whack 'em and stack 'em on the Rappahannock around this time of year. The old timer is right - on good days it is every cast! I used red wigglers as bait and it was money. 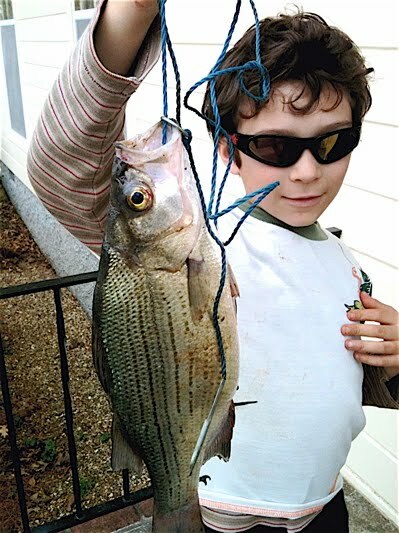 Few better fish to crispy-fry whole, and the fillets off the big ones are a lot like their cousin, Mr. Striper.